The Audi A6, now available near Austin, TX, combines luxury with practicality. If you are looking for something that brings comfort and convenience to your everyday driving, then the Audi A6 could definitely be in your future. But why pay for the price of a new one? Buying a used vehicle can potentially be easier on your wallet while still providing you with a comfortable and powerful vehicle. While we can’t specify which engine you’ll get, since that depends on what year of the A6 you get, the 2.0L 4-Cyl Engine is among one of the more recent A6 models. This particular engine has an EPA-estimated fuel efficiency of 20 miles per gallon in the city and 29 on the highway. Of course, this depends on the driving conditions of the road, as well as your own driving style, but that should give you an idea of the engine and fuel economy that this vehicle has. Of course, these aren’t the only features on the Audi A6. Check out some of the other features below. For your conveniences, as well as safety, you can find a Remote Keyless Entry system that has an integrated key transmitter, a courtesy illuminated entry, perimeter alarm, and a panic button. You can also find yourself with a leather steering wheel to go along with the leather seating. The Audi A6 also can have the Electronic Stability Control, and Electric Power-Assist Speed-Sensing Steering. Don’t forget to check out the refrigerated/cooled box, which you can find in the glovebox. You’ll also have rear door bins, and first row under seat storage. Again, all of these features are dependant upon what year you get of the Audi A6. 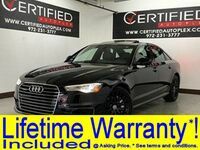 If you are interested in the Audi A6 the come on over to Certified Autoplex. You can speak with our team of professionals, who will be happy to tell you more about this vehicle. You can also take the Audi A6 for a test drive to see the specs and features for yourself. 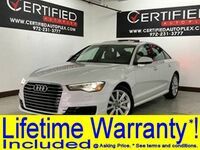 Interested in a Audi A6?